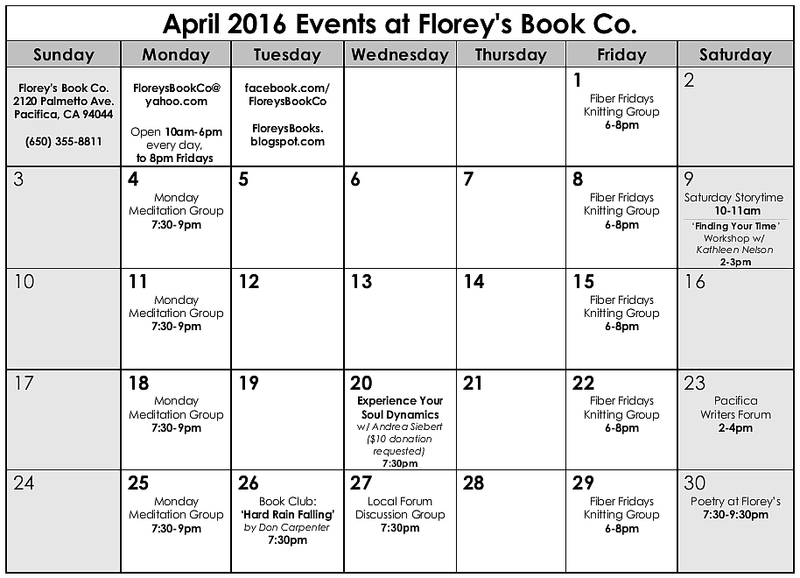 April 2016 Events at Florey's Book Co.
A fun, interactive workshop to help you carve out time to pursue your happiness! Local Forum: 'The Power of Money', March 30th at Florey's! Our topic this month is 'The Power of Money', both the positive and negative effects, no one can deny that money does have the power to do big things. Philanthropy, politics, big business, changing the world. Challenge yourself here. If you were suddenly given $1 billion dollars... what would you realistically do with it? Do some research, maybe come up with a detailed plan. What, if anything, would you give away? What, if anything, would you keep? Does money enable happiness, freedom, power or something else? Does money equal power, and does power equal corruption in every case? Share your books, articles, movies, talks or whatever, on the topic with the group and I'll see you there on March 30th, at 7:30pm at Florey's to discuss!! 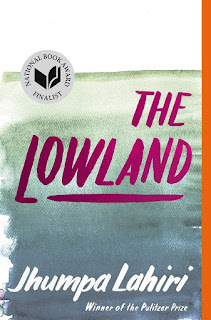 Pacifica Book Club: 'The Lowland', March 29th at Florey's! Come by for a chat about our February book, 'The Lowland' by Jhumpa Lahiri. Two brothers bound by tragedy; a fiercely brilliant woman haunted by her past; a country torn by revolution: the Pulitzer Prize winner and #1 New York Times best-selling author gives us a powerful new novel—set in both India and America—that explores the price of idealism and a love that can last long past death. Growing up in Calcutta, born just fifteen months apart, Subhash and Udayan Mitra are inseparable brothers, one often mistaken for the other. But they are also opposites, with gravely different futures ahead of them. It is the 1960s, and Udayan—charismatic and impulsive—finds himself drawn to the Naxalite movement, a rebellion waged to eradicate inequity and poverty: he will give everything, risk all, for what he believes. 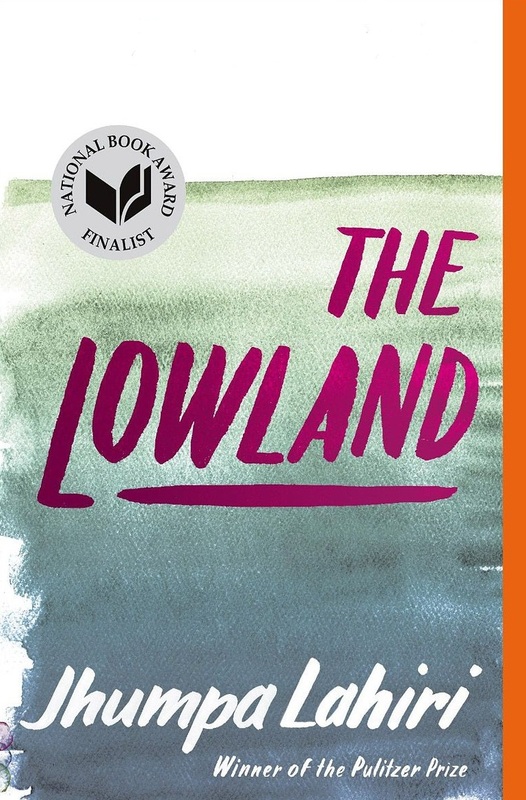 Suspenseful, sweeping, piercingly intimate, The Lowland expands the range of one of our most dazzling storytellers, seamlessly interweaving the historical and the personal across generations and geographies. This masterly novel of fate and will, exile and return, is a tour de force and an instant classic. 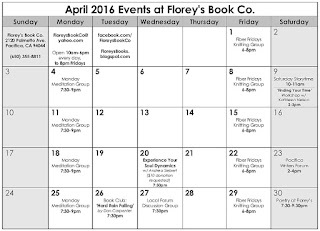 March 2016 Poetry at Florey's! The featured poets this month are: Jennifer Swanton Brown and Amanda Williamsen. The featured poets will be followed by an open mic period. Open mic sign-up is first come, first served. This event is open to the public and free of charge. You are welcome to bring a snack or beverage to share. 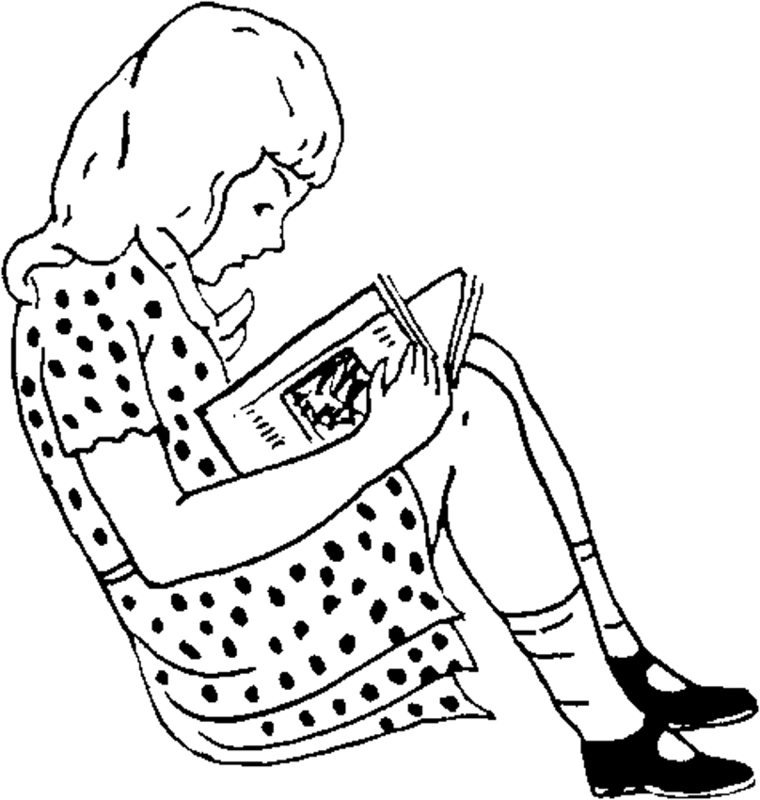 Jennifer Swanton Brown published her first poem in the Palo Alto Times in the fifth grade. She has been a frequent poet-teacher with California Poets in the Schools since 2001; she served on the CPitS Board of Directors (2013-2015) and represented them as prompter for the California Poetry Out Loud state championship in Sacramento (2014, 2015). Her poems have been published in multiple local journals, including Caesura and The DQM Review and several anthologies. She studied Linguistics and Nursing, receiving a Masters of Liberal Arts in 2012. Brown served as the second poet laureate (2013-2015) for the City of Cupertino, California, where she lives with her family. Brown manages clinical research regulatory affairs for Stanford Medicine. Amanda Williamsen grew up in the farmlands, forests, and floodplains of rural Ohio along the Maumee River. She is now writing a poetry memoir influenced by that landscape, which she intends to become her first book. And as the new Poet Laureate of Cupertino, she's offering a series of classes on writing a poetry memoir, where participants can explore their own landscapes and memories. She has taught writing in elementary schools, high schools, and universities, and her writing has appeared in a variety of literary journals, including the Baltimore Review, New Ohio Review, The Fabulist, and Midwestern Gothic. She earned her M.A. from the Writing Seminars at Johns Hopkins University. 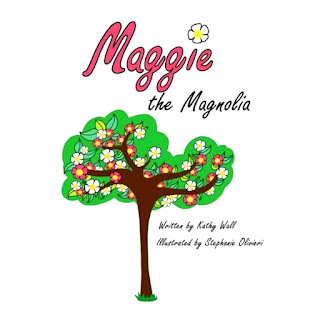 "Maggie the Magnolia" Book Event with Author Kathy Wall, March 26th at Florey's! 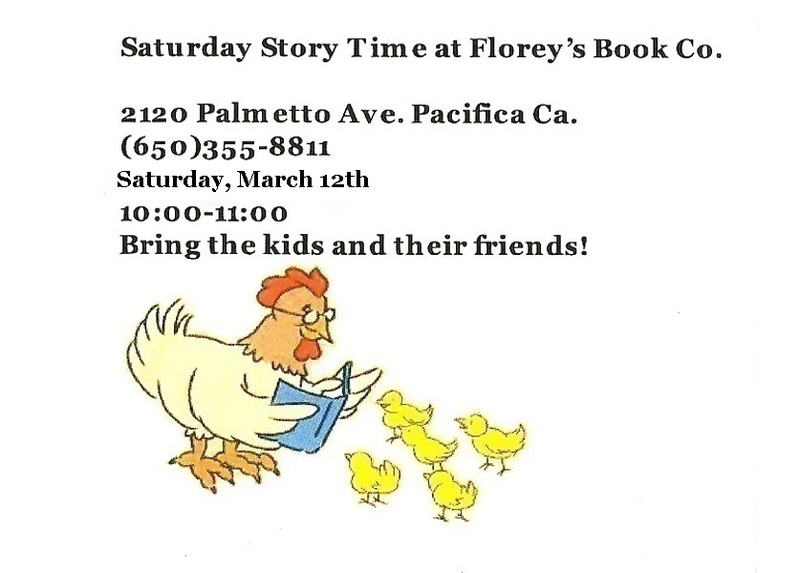 Florey's Books welcomes author Kathy Wall as she discusses her new children's book, "Maggie the Magnolia". 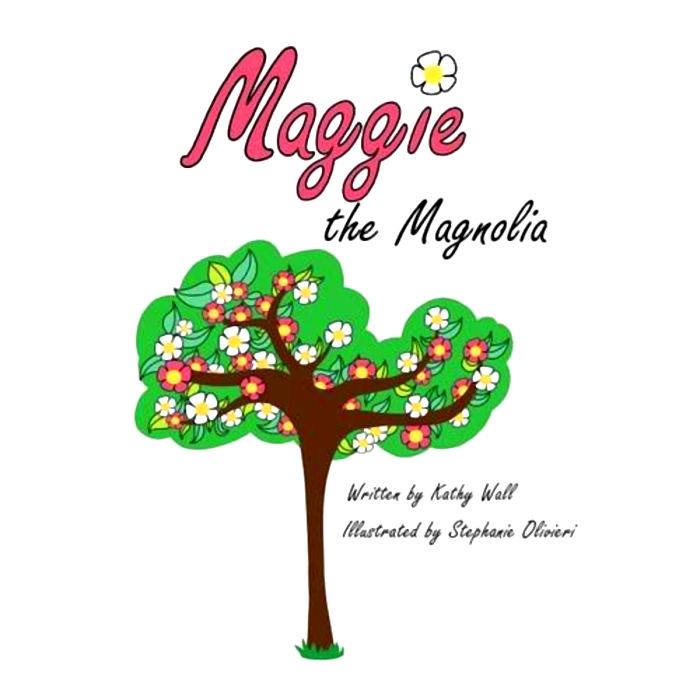 Maggie the Magnolia is the (mostly) true story of a tree Kathy purchased many years ago and managed to get home in her little red car, and the heartwarming tale of a little tree hoping for a new home, and her adventures while finding it. Kathy Wall lives just over the hill in Brisbane. She loves to write and this is her first book, with many more hopefully to come! 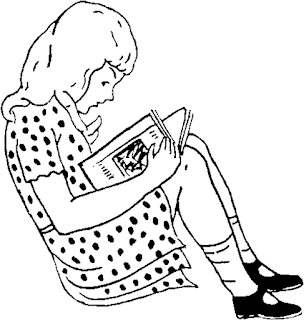 She is currently working on 2 more children's books, as well as a non fiction adult book. She is the mother of two sons, grandmother of three adorable little ones. 'Experience Your Soul Dynamics' with Andrea Siebert, March 16th at Florey's! 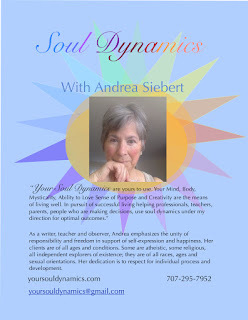 Florey's Books welcomes Andrea Siebert as she discusses Soul Dynamics. 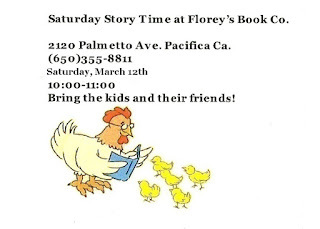 Pacifica Writers Forum, March 12th at Florey's!